Today our First World War Centenary: Honouring Canada’s Victoria Cross recipients, remembers Lieutenant Gordon Muriel Flowerdew, who received the Victoria Cross, the Commonwealth’s highest award for gallantry, for his actions at the Battle of Moreuil Wood on this day 100 years ago. Flowerdew was born in Billingford, England, on January 2, 1885. He immigrated to Saskatchewan in 1903 and later settled in British Columbia as a rancher. He enlisted in September 1914 in Lord Strathcona’s Horse, a cavalry brigade, and became a commissioned officer in 1916. By 1918, Flowerdew was Lieutenant (Acting Captain) in command of “C” Squadron of Lord Strathcona’s Horse. Though the cavalry brigades had not engaged in much direct fighting because of the static nature of trench warfare, this changed in the spring of 1918 with the return to rapid, open warfare. On March 30, 1918, the Strathconas were engaged in heavy fighting at Moreuil Wood, France, having been tasked with preventing the Germans from crossing the Avre River and advancing on Amiens. As German soldiers entered Moreuil Wood, Acting Captain Flowerdew spotted two lines of German infantry positions supported by machine guns. He ordered a cavalry charge. His squadron passed over both German lines, attacking with their swords, and then turned and passed over the lines again, driving the defending German soldiers into retreat. According to Flowerdew’s Victoria Cross citation, by then the squadron had suffered 70 percent casualties, killed and wounded, and Acting Captain Flowerdew was badly wounded in both thighs. Nonetheless, Flowerdew continued to encourage his men, ordering them to dismount. Through hand-to-hand fighting, the survivors managed to hold the previously occupied German positions until a unit led by Lieutenant Frederick Maurice Watson Harvey joined them. 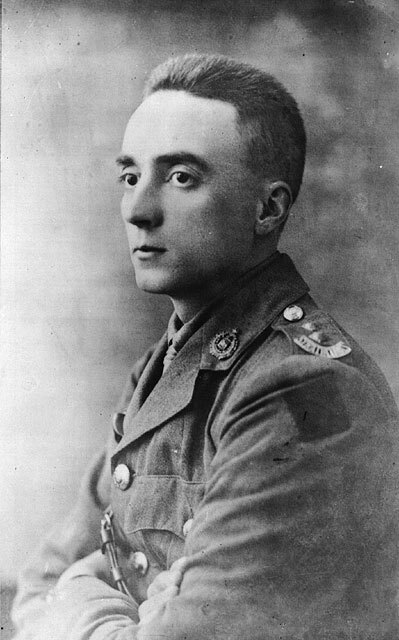 Harvey had received the VC in 1917 for his role in the attack on German positions at the Guyencourt, France. Flowerdew and his men prevented the capture of Moreuil Wood and denied the advancing German army a strategically important position. Lieutenant Gordon Muriel Flowerdew died of his wounds on March 31, 1918. He is buried at Namps-au-Val British Cemetery in France. Library and Archives Canada holds Lieutenant Gordon Muriel Flowerdew’s digitized service file. 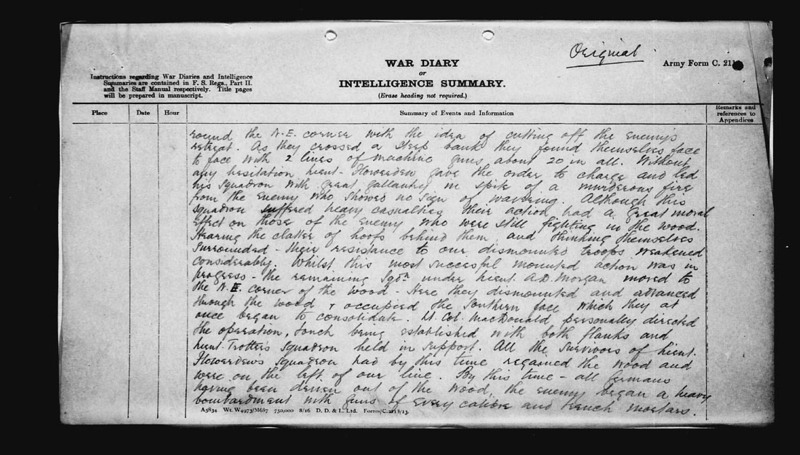 This entry was posted in Digitization, Military Heritage and tagged Canadian Expeditionary Forces, First World War, Military, VC, VC series, Victoria Cross by Library and Archives Canada Blog. Bookmark the permalink.